Turn the oven onto 180 degrees before you become a messy nelly. And make sure you grab out some foil. Cake mixture on your kitchen cupboards is no fun. This mixture makes about 12 - 16 (this is a guess.. and don't be sad if it's less!) and they normally cook for 15 minutes or so. But because I am a rebel, I just go with the flow. And when my knife is clean, I know they're ready! 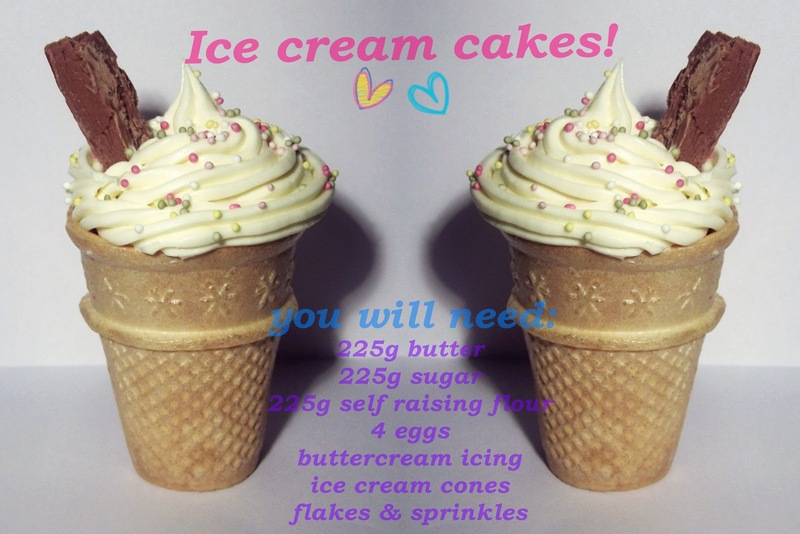 So look at all the blurry photos (it's hard snapping whilst baking) for your step by step(ish) guide! And unlucky if you don't have a dishwasher! And that is how you make these delightfully looking cupcakes. I also want to mention that I mean mix it in a nice big bowL not a bow. That would just be silly. And unless you like burning things, I highly advise you wrap the cones in foil to keep them nice looking. They may like the heat, but they really don't like sun burn. Serve them with a nice cup of tea and enjoy the mess people make when attempting to eat these..! PeeEss - Completely off subject from cakes. Shoes (shoes and cakes should be enjoyed together!) but I designed a simple shoe on Nelly. I'd appreciate it if you voted for it here.. only if you like it OF COURSE. Or that would be silly!